Learn how to focus on seeing key shapes in your subject, and use this technique to paint a portrait in oils. 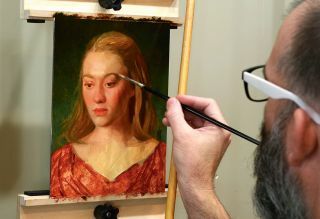 Learning how to paint a portrait isn't easy, but there are some steps you can follow to help you on your way. In this tutorial, I'll show you my process, from blocking in the shadows to developing the form and making each brushstroke count. Learning to draw and paint is a lifelong and fulfilling process, so learn to enjoy the journey. I use a grid to create my drawing. I use pencil for the grid and when the drawing is done, I ink the important lines with a Micron Pigma Pen or India ink and then erase the grid. I also like to use a warm colour to start with. Bear in mind that the tint of your canvas will affect your final painting. Little patches of it will show through and add vibrancy. The imprimatura is usually one or two pigments that are thinly painted over a toned canvas. Here I'm using Raw umber and Light red. This is the stage to focus on establishing the shadow shapes. Don't worry about perfect edges and brushstrokes. This stage is simply about creating accurate shapes. Let the paint be a bit washy in places. The variation is interesting, and will show through and add depth. Now we begin to establish the colour for the flesh. Look for middle values in the light side and avoid the highlights for now. Like Frankenstein's creation, parts are coming together, but it still looks a little monstrous. Don't panic – slow and steady work will win the day. Keep your flesh colours simple, using only two or three pigments. Keep the "mud" out of your colours by mixing with like-temperatures. You can neutralise your colours with a grey of the same value. Now that the colour and values are in place we can start to work the transitions from dark to light. Try to mix the right colour rather than blending on your canvas. This will train your eye and improve your ability to mix colour. Focus at this stage and aim to mix the right colour with each stroke. Remember not to lose the big shapes as you refine the forms. Don't be afraid to make artistic decisions throughout the painting process. You aren't a slave to your subject. I'll often add splashes of bright colour to the background and subject in the final moments. It adds vibrancy and is a lot of fun! This painting has a green/red palette that adds a strong energy. Analogous or monochromatic palettes are useful when creating mood.